At 330 meters, the Ryugyong would have been the World’s tallest hotel had North Korea completed it in 1989 as planned. After decades of delay it is set to open in 2013. See the story below. Note: My group at Expedia is working on semantic search. That’s all I have permission to share for now but we’ll release more details in the future. Online travel industry experts have been promoting the importance of semantic search to support new, easier and more powerful ways for customer to find and book travel products. Semantic search and natural language processing allow customers to interact with a travel search and booking system as if communicating with a human agent and without having to know explicit travel details up front. In the near future a family could begin planning their vacation on a tablet device running an Expedia application. Mom says: “We would like to go to the beach, enjoy good food and have fun activities for the kids.” The application would understand the initial natural language statement and correlate qualifiers like “beach”, “good food”, and “fun kids’ activities” with a knowledgebase of worldwide reviews and other data sources. The system will be able to engage the family in conversation and ask clarifying questions where necessary. Combining this information with transportation, lodging and activities inventory, the system will offer personalized recommendations. The end result will be a booked vacation itinerary that satisfies the family’s travel aspirations and budget. Coincidentally, after I wrote the family travel search scenario above, Tnooz reported on Desti, a new iPad app that realizes the first half of my scenario, implementing a limited but very compelling slice of what I’ve described. Expedia is pioneering a new segment that no other major online travel agency has entered in a serious way: destination experiences such as tours, activities and local attractions. Hotels and airlines will be able to sell destination experiences using Expedia channels. Expedia is enabling the new services through a B2B channel known as LocalExpertHub.com. Tnooz has an excellent, comprehensive article on the new initiative. 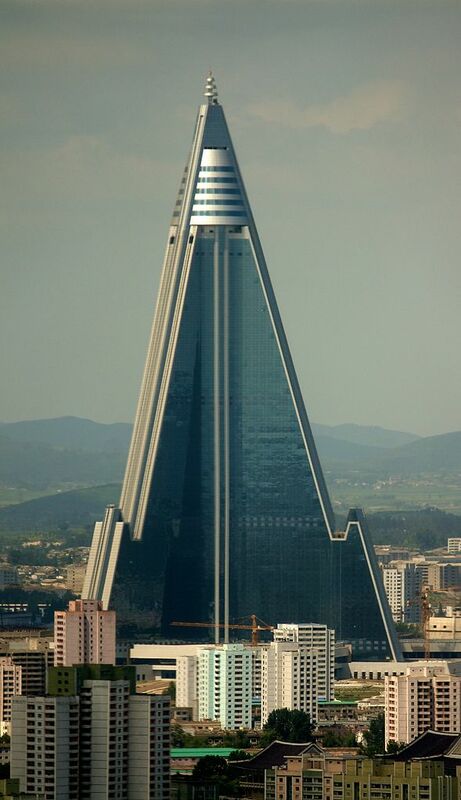 North Korea planned to complete the world’s tallest hotel, the Ryugyong, in 1989. The building topped out as North Korea’s tallest but construction fell behind schedule and was halted in the post-soviet economic crisis of 1992. No further activity took place from 1992 until 2008 when construction resumed. Completion is now planned for 2013 but based on current rankings the finished edifice will likely only rank as the world’s fourth tallest hotel at that time. Only a few thousand western tourists per year visit North Korea so the hotel will likely be dependent on the patronage of the 60-70,000 Chinese tourists visit per year. HotelChatter has a nice photo from another angle and some additional details. 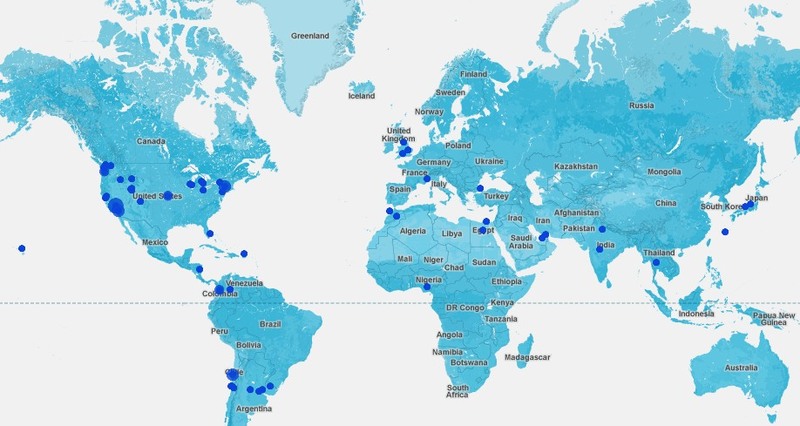 Sean O’Neill at Tnooz wrote a nice article on startup Traverie.com, a travel aspiration app that compiles destinations from your Facebook friends and presents them on a map and in photo albums to enable you to build a travel log/bucket list. I tried it out and immediately found that some friends had been to interesting places I wasn’t aware of. Their map view could use some design refinement with special attention to the colors—I actually manipulated the screenshot above to make details stand out better. It’s worth trying out though—you’ll learn more about your friends and likely discover some places you would like to travel to. Brand USA, a US public-private travel promotion corporation established by an act of Congress, is partnering with Orbitz on advertising support and an ebookers iPad app. Brand USA partners with many US firms; for example, earlier this year it partnered with Expedia Media Solutions. VB: How have you changed personally since you started traveling? AH: I’ve developed a lot more empathy to the world; perhaps that is just growing up. There is a feeling you get when the sights, sounds, smells, and language is something completely new. You feel lost. You are lost. Identifying who you are in such a situation is something I think everyone should experience. VB: What do you think holds people back from seeing the world? Travel is deeply personal. I can’t stress this enough. Your experience, by design, will be drastically different than mine or anyone else’s. Your lessons, activities, destinations, insights and goals will have their own unique color and flavor. When the cost and logistics of travel get out of the way it makes space for even more incredible, personal experiences.